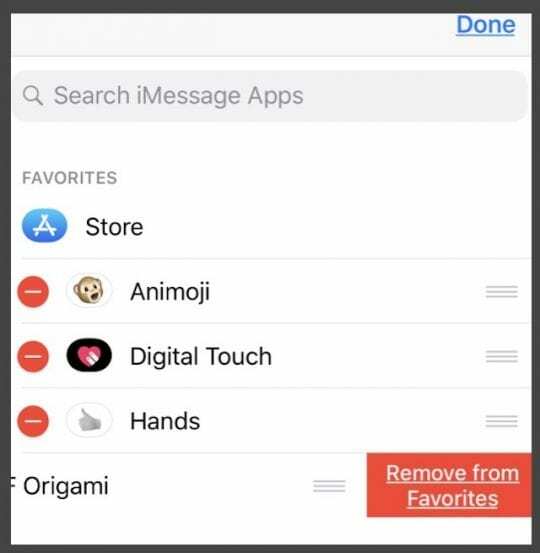 Many of us love using apps and stickers when sending iMessages to friends and family using our iPhones, iPads, and iPod Touches. Now that the app drawer is right at the bottom of our Messages, it’s easy to include stickers and apps in our texts! 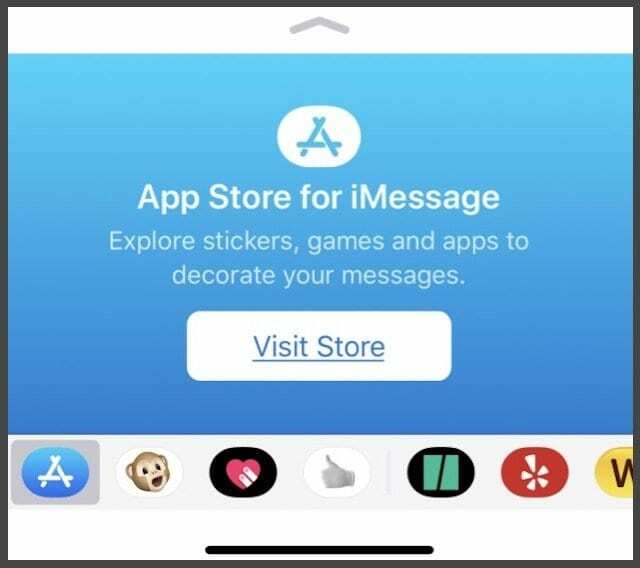 But one thing is not very clear–just how do you delete or update iMessage apps, games, and stickers using the iMessage App Store? 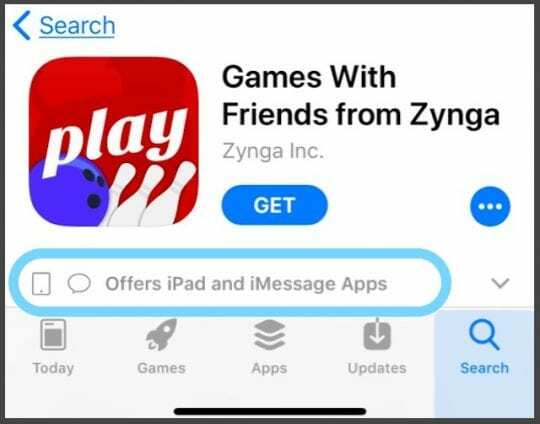 What’s confusing about the iMessage App Store is that some apps are standalone iMessage apps, while others are iMessage extensions of primary iDevice apps. Apple manages extension apps via your iPhone/iPad/iPod Touch App Store. And it’s often hard to tell these apart! 2 Managing iMessage Apps is Confusing! 2.1 Where is the iMessage app store? 2.2 There’s No iMessage App Store Update Option! iMessage standalone apps only live in the iMessage App Store and have no associated app on your iDevice’s Home Screens. 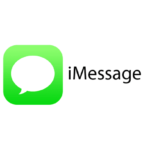 Standalone iMessage apps let users interact without ever leaving Messages. Many sticker packs are iMessage standalone apps while most iMessage gaming and productivity apps are extensions of their larger iOS apps. For iMessage stand alone, you can install, delete, or update via the iMessage App Store. Standalones should also show up in your main App Store. On the other hand, associated iMessage apps work in iMessage but are an extension of the main app that’s managed via the App Store. These iMessage extension apps automatically install, delete, and update whenever you make changes to the main app. Managing iMessage Apps is Confusing! So if your stickers, games, or other iMessage apps associate with an iOS app, then updating the app via the App Store also updates any associated stickers. So it’s as simple as opening the App Store app, selecting Updates, and updating those apps that contain your iMessage apps. 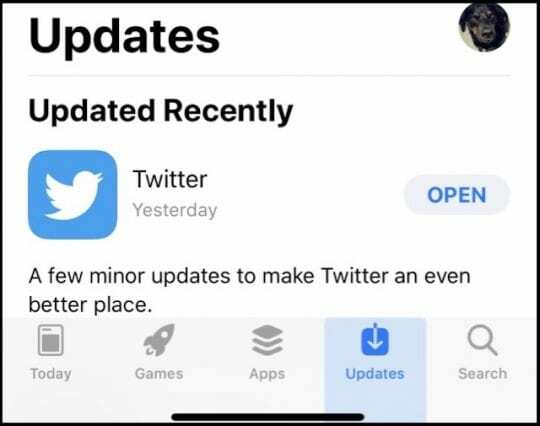 Updating via your main App Store should also update any standalone apps; however, many readers tell us that their iMessage only apps (standalone) are NOT updating via the App Store! 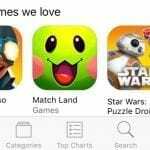 So it makes sense to check the iMessage App Store–right? Where is the iMessage app store? Not sure how to how to access iMessage app store? Finding the iMessage App Store is pretty easy. 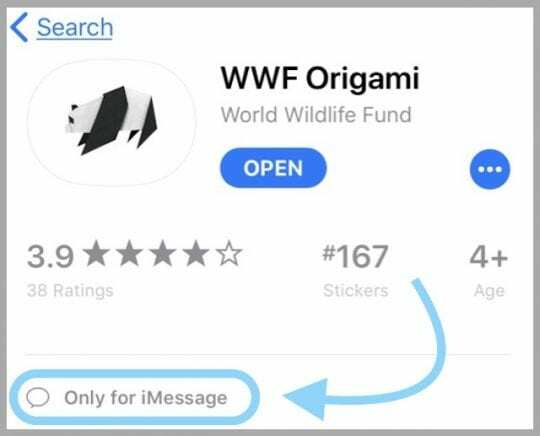 Open a message and look for the App Store icon–you’ll find this icon just to the left of your message entry and in the App Drawer. Tap the App Store icon, and you’re automatically taken to the iMessage App Store. There’s No iMessage App Store Update Option! But if your stickers (or other iMessage apps) are standalone and NOT updating via the main App Store, Apple currently offers no “update” option available within iMessage’s App Store. Instead, the workaround is to delete the sticker pack and reinstall it. Yes, it’s such a tedious process! So before you go through these steps, try and update all your iMessage apps the old fashioned way via the main App Store. 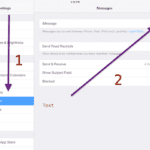 Only perform these steps if your App Store isn’t updating your iMessage only apps. We don’t understand why the iMessage App Store doesn’t have an update function–so use this very inelegant workaround until it does! Of course, some of us really don’t like or want to use iMessage apps, stickers, and games. We want to keep things simple…and clean. 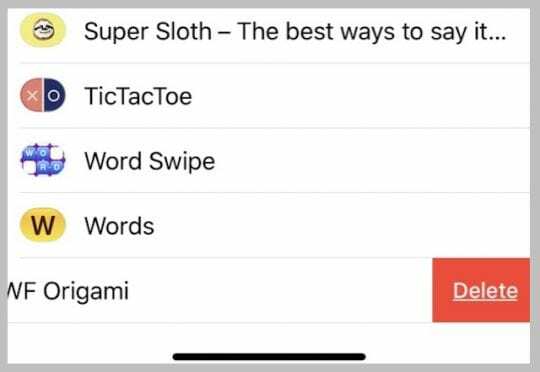 So for folks out there wanting to turn off iMessage apps ios 11, desiring fewer options, or thinking of changing things up in their App Drawer, here’s how you do it. Are you using Messages in the Cloud? Check in Settings > Apple ID Profile > iCloud > Messages. It’s possible that with Messages enabled on iCloud, it’s not allowing you to delete the sticker pack. Try toggling this off temporarily, and then deleting the sticker pack in iMessage following the instructions above. Remember that you need to remove it from your favorites before you can delete it! Another option is to check if you can delete it via Settings > General > Storage > Messages > GIFs and Stickers (tap that.) See if the sticker pack shows up here–if so delete it. Finally, if the sticker pack is associated with an app, you may need to delete the app (or update it) to delete/update the sticker pack. 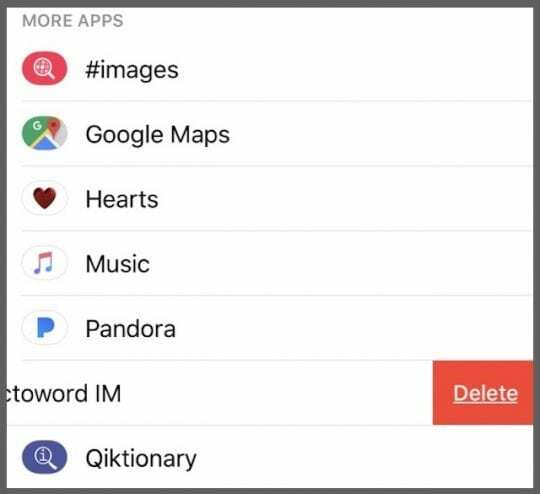 Your process does not actually delete the apps. It just removes them from the list. My problem is I have a son who is struggling with looking at inappropriate images in the #images app. He shares his struggles with me, and while it would be great if he just “wouldn’t do it,” the reality is the stresses of life make that difficult. So what I want to do is DELETE the #images app from iMessage altogether. If I use your process to “delete” it from the list, all he has to do is tap “Edit,” then it appears again, just with the button switched to the off position. It is not deleted. I have the phone locked down via Restrictions, so he cannot add or delete apps, and we use a tool called Covenant Eyes to filter his browser. 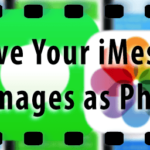 The only hole in this system is that darn #images app in iMessage. If you can tell me how to actually DELETE it, not just make it disappear from the list, to the point where he would have to reinstall it, that would be greatly appreciated!! Thanks for the info about iMessage stickers. I couldn’t figure out how to update them since they weren’t updating via the regular App Store. I deleted them and reinstalled using just the iMessage AppStore and now no more updating showing! Yea! You bet Leslie! Glad it worked for you.